This baked pumpkin French toast casserole is full of holiday flavors like pumpkin, cinnamon and ground ginger, serves at least 8 people and is prepped the night before so all you have to do is bake it in the oven the next morning. 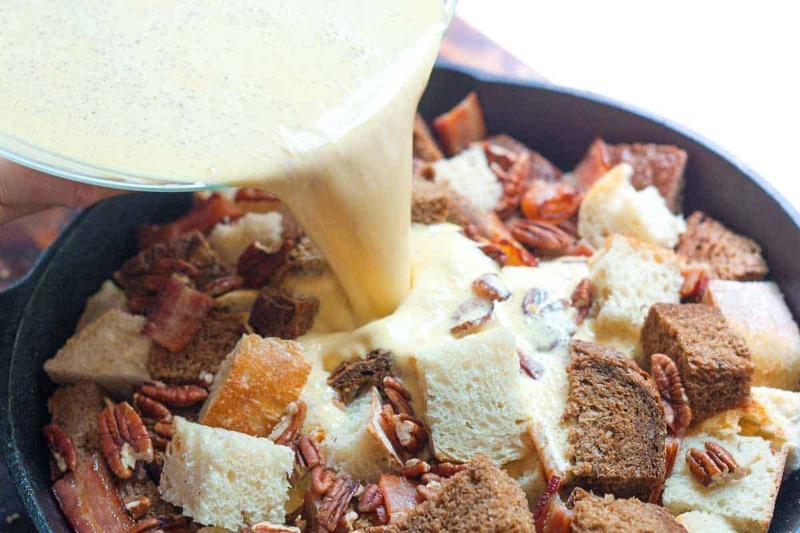 Jump to the Baked Pumpkin French Toast Breakfast Casserole Recipe or read on to see our tips for making it. We are big fans off eggs — you might have already known that, especially if you’ve see our Kale with Egg and Toast, Smoky Green Salad or Portobello with Eggs. So, when we were asked by Betty Crocker and Land O Lakes to share one of our recipes that takes advantage of our favorite ingredients, we said yes. You’re going to need some day-old hearty bread. Go for a French loaf or do what we did, use half a French loaf and half of a pumpernickel round. We loved the look when using two breads. Then you need half and half, eggs, pumpkin puree (from a can), brown sugar, bacon, nuts, spices and maple syrup for when you serve. Start by mixing the eggs, half and half, pumpkin puree, brown sugar and spices together. For the spices, we used cinnamon, ginger and nutmeg. Fill a large baking dish with the bread. Then scatter bacon pieces and nuts on top. Note: When we originally created this recipe, we used a cast iron pan. 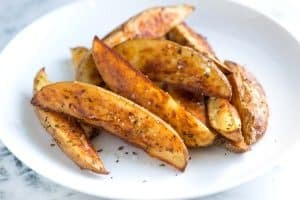 After a comment from one of our readers, we have learned that acidic foods can actually cause a cast iron pan (especially newer or unseasoned cast iron pans) to impart an iron/metallic flavor into the food. 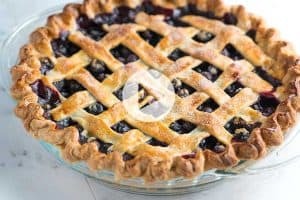 Because of this, we have decided to call for a 9-inch by 13-inch baking dish instead of a cast iron pan in the recipe below. Pour the egg mixture all over the bread, bacon and nuts and press down onto the bread to make sure all the bread is moistened. Cover with foil, place into the fridge and go to bed. The next morning bake the casserole in a 350 degree oven for 40 minutes covered and another 20 minutes uncovered until it’s golden brown and puffed. Then serve warm with lots of maple syrup. 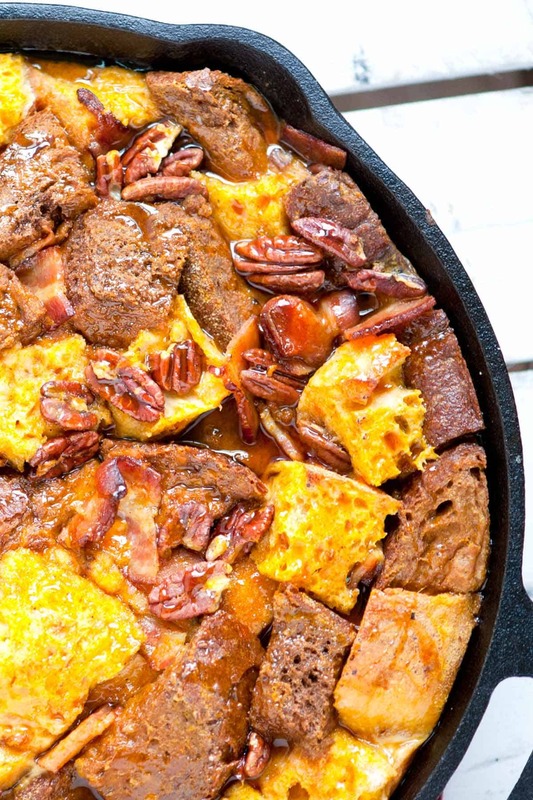 Did you like this breakfast casserole recipe? If so, you may also enjoy another breakfast casserole with oatmeal, strawberries and banana. Prep this breakfast casserole the night before and wake up to an easy breakfast or brunch that is packed with holiday flavors. Note: When we originally created this recipe, we used a cast iron pan. After a comment from one of our readers, we have learned that acidic foods can actually cause a cast iron pan (especially newer or unseasoned cast iron pans) to impart an iron/metallic flavor into the food. Because of this, we have decided to call for a 9-inch by 13-inch baking dish instead of a cast iron pan in the recipe. Add bread pieces, bacon and nuts to a 13-inch by 9-inch baking dish or 12-inch oven safe skillet. In a large bowl, whisk the eggs, pumpkin puree, half and half, brown sugar, vanilla extract, cinnamon, ginger, nutmeg, and salt until well blended. Pour egg mixture over bread, making sure they are evenly covered. Press the bread down slightly to help the bread absorb the egg mixture. 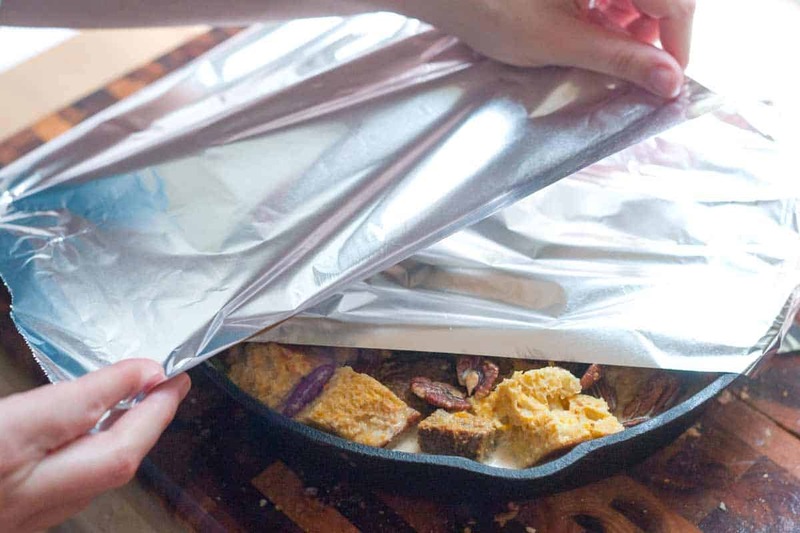 Cover with aluminum foil and refrigerate 8 hours or overnight. The next day, heat the oven to 350 degrees F. Bake covered for 40 minutes and then uncovered for 20 minutes, or until the center is set and the top is puffed and golden brown. Serve warm with a drizzle of maple syrup. Since dear husband was diagnosed lactose intolerant, I substituted coconut milk (full fat, not the light!) for the cream/half&half. Oh gosh, it’s better if that’s possible! Do you have nutritional information for this recipe? 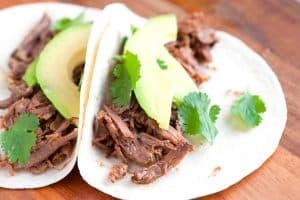 Wondering if I can make this for diabetic family members without having to give them a one inch cube as the whole meal. Hi Bruce, We do not provide nutrition facts for our recipes at this time. It is something we are looking into, though. For now, you may need to copy and paste the recipe ingredients into an online recipe calculator. What size of canned pumpkin did you use? I am assuming the smaller but don’t want to take chances. I hope to make this for my Sunday School class this weekend! Hi Lisa, we only call for a cup of the pumpkin puree. Hi Kathy, The concern from other commenters came from the length of time the casserole would be in the pan (since it can be an overnight recipe). Brown sugar is a little acidic. It is completely up to you as far as what dish you use. We did not really come across any problems from our cast iron pan, but since it could be an issue for others we thought it was better to be safe than sorry. Couldn’t you also make this in a crockpot? Sounds delicious and I can’t wait to try it. This is an amazing dish…but I put a small twist on it that made it just a tad bit different (very tasty) instead of all of the half and half I used 1 1/2 cups half and half and 1 1/2 cups of egg nog and omitted half of the eggs. 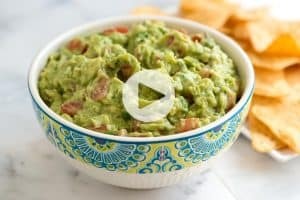 It is really delicious and please try it….it gives more of a “holiday” flavor to the dish and I personally will make it this way all of the time. Hi Susie, love your twists! 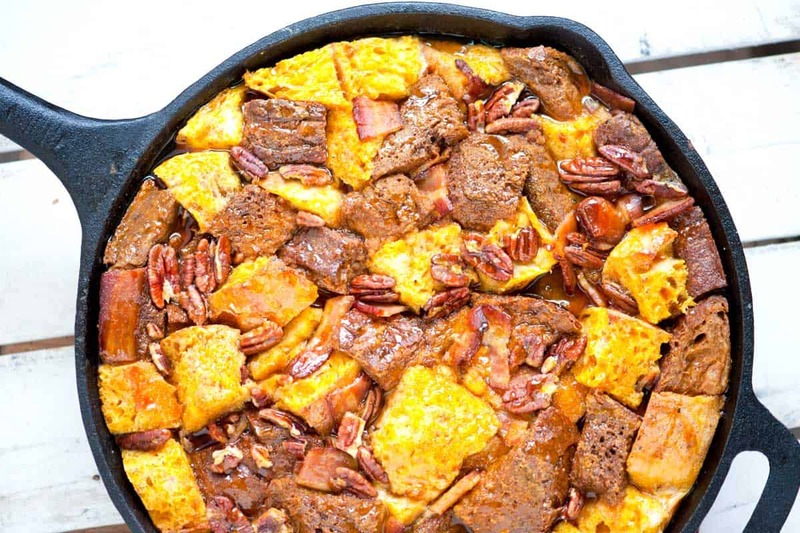 Do you really overnight your casserole in a cast iron skillet? How do you keep it from getting that iron flavor? Hi there! Great question — Our cast iron skillet is really well seasoned, which is why we have never found a problem. However, with some research (thanks so much for asking this question), we found that it is common that acidic foods can cause the cast iron pan to impart some iron/metallic flavor into the food. So, after learning this, we’ve changed our recipe and call for using a baking dish instead. Ooh my… I want this for breakfast right now! It looks absolutely amazing. I’m thinking this will have to make an appearance at my house on Thanksgiving morning so I have fuel for the day in the kitchen! I can’t have enough of those eggs too! please continue posting amazing egg recipes! This bread pudding looks wonderful. its different from the one i usually have cuz you used 2 different breads! amazing idea… playing with textures! why had i never thought of that!